The Scion tC is one coupe option from the youth-oriented manufacturer; the FR-S being the other. While they offer a different type of vehicle and driving experience, they have similarities. Offering a smoother, more composed-less sporty-ride, the 2016 tC is a lot of car for the money. The tC manual version starts at a very reasonable $19,385; the six-speed automatic at $20,535. Our test tC came without any options, making the total vehicle price a pleasing $21,330. This writer did a double-take at the Monroney. Since when have I had a window sticker in my hand with such a reasonable price? For those drivers wanting to customize their tC, they will find aftermarket appearance and performance upgrades through the dealer. The 2016 Scion tC is a great value. Equipped with about all a driver needs.Loaded with safety features, the tC is also equipped with up-to-date technology, including Bluetooth, Hands-free phone capability, AUX/USB port w/Pod connectivity, Aha apps, Smart Key w/push-button start, music streaming, etc. Power windows, locks and mirrors are standard, as well as steering wheel audio controls, and a sunroof! New for 2016, the Display Audio System is standard equipment. The driver seat is manually adjusted, and can be set for height. The driverâ€™s side window is one-touch automatic up/down. Seating surfaces are trimmed in leather and although stiff, are supportive. The tCâ€™s three-spoke steering wheel is tilt/telescopic and has audio controls. Cruise, A/C and 60/40 split reclining fold-fit rear seats are also standard. The rear seats recline somewhat. Donâ€™t expect heated seats in this coupe, but then itâ€™s an entry-level vehicle. In addition to supportive seating, the tC is an easy coupe to maneuver, takes most road surfaces well and doesnâ€™t feel as cramped as say, the FR-S. The 2.4-liter, inline 4 engine in the tC is smooth, runs well, but somewhat under-powered for our taste. While the FR-S rides low to the ground, as expected, the tC sits higher. The updated styling of sharp angles and added creases in the corners make the tC look inviting, and new. This hatchback is a front-wheel-drive vehicle, and we had no trouble maneuvering in Chicagoâ€™s snow. Equipped with stability control, traction control and ABS, the tC performed well. Drivers will appreciate the oft-forgotten rear window wiper. Why more hatchbacks donâ€™t come equipped with this needed piece of equipment is beyond us. Projector beam headlamps and LED accent lights provide much needed light, and the panoramic glass moonroof is a nice addition. Perhaps not as agile as the FR-S (nor is it supposed to be), the tC fits that spot that says â€˜a reasonably priced entry-level, great-looking coupe., A great first car purchase for young drivers, the Scion tC is well-equipped and appointed. EPA Fuel Economy: 23/31 mpg. I ran into an acquaintance yesterday who not only remembered my name-when I could not recall hers-but also remembered that when we had a discussion about what cars to buy, she recalled right away that I recommended the Kia brand. Funny how some things don’t change; and this writer’s recommendation of the Kia vehicles hasn’t waned. This week we spent some time in the redesigned Kia Optima. Our model, the SX Limited (MSRP $35,790). In a beautiful royal blue, the 2016 Kia Optima adds more interior features, is available in five trim levels and is still reasonably priced. The entry-level LX model begins at $21,840 and goes up from there: EX ($24,340), SX T ($27,700), SXL ($35,790 and the Limited ($35,500. Our SX Limited version carried an MSRP of $36,600, putting it in the category of luxury sedan pricing (think Infiniti Q60, Lexus IS, etc). Good company, but for a lot less. For 2016, the Optima increases trunk space to 15.9 cubic feet, providing a wider opening. Rear seats are split-folding and make it possible to tote a lot more stuff. While we prefer the original styling of the Optima, the 2016 look is more conventional and ‘common,’ should we say. Still a handsome sedan, the Optima is one of our favorites. There is a lot to like about the 2016 Kia Optima; namely the Panoramic sunroof, large 8-inch display screen, and such features as Supervision Meter Cluster, 10-way power seat, heated rear seats, LED fog lights, power-folding side mirrors, heated steering wheel, MP3 audio ready system, push-button start, and very cool diamond-quilted Nappa leather seat trim. Larger, taller, wider, the 2016 Optima has a quiet, composed ride. We found the engine somewhat wanting, but adequate for most driving situations. There was no lack of get-up-and-go when navigating the highway ramp. Drive-abi lity isn’t the most solid. This writer has a tendency to compare with performance sedans, which isn’t accurate. We did think though, when navigating slippery streets, the Optima acted as though it might not hold the road. One thing we found is that the driver cannot look away and expect the car to hold the road. Doing so for seconds at a time, this writer experience a lot of wander. The Optima is equipped with the UVO eServices system which includes 911 Connect, a service that automatically dials out to emergency responders following a collision and an air bag deployment. New features for UVO eServices include Speed Alert, Curfew Alert, Geo-Fencing, and Driving Score. Also new, and taking a little getting used to is a reversing camera blind-spot warning system with rear cross-traffic alert, and an Advanced Smart Cruise Control system with forward-collision warning and Autonomous Emergency Braking are available as options. sound is evident; you’ll find yourself looking around the cabin! EPA Fuel economy: 24/35 mpg. *Fiat 500 Topolino-a car driven by Italians after WWII, the Fiat 500 was available during the 1940s-50s and sold for $5,434 (American dollars). *Morris Minor: Built and sold in the UK, the Minor sold for $12,500 in 1968, and Morris lost $168 on every one sold! *Cherry QQ: China, 2003, $4,781. *Peel P50-the smallest car ever manufactured at 54 inches long and 41 inches wide! Built and sold in the UK in 1962, sold for $4,420. *Ford Model T (of course): U.S., 1908, $3,895. *ZAZ 968A: Built and sold in the Ukraine in 1972, $3,351. *Eshelman Model 2: An “Adult Sport Car,” the 3 horsepower car was built in 1955 in the U.S., and sold at a cost of $3,455. *Banner Boy Buckboard: U.S. in 1906. A DIYer, the Buckboard ran on two bicycle-type wheels. *Tata Nano: India, 2008, $2,598. The ever-popular compact crossover sport ute, Toyotaâ€™s RAV4 comes into 2016 with a little bit different style and some new technology; some of which we found a tad annoying. The now standard equipment rearview backup cameras are a good thing, no question. But they do take some getting used to. The last couple of test vehicles we’ve driven have come equipped with their own version of safety sensors and a pre-collision system, as well. When driving the RAV last night, I attempted to make a lane change; kind of last minute. Itâ€™s amazing I didnâ€™t get clipped, as out of nowhere, I saw a minivan passing me on the right. I never saw him coming, nor did the light illuminate in the RAV’s side mirror. Not familiar with just how this technology works, I wonder if maybe the minivan was out of the range of the RAV’s sensor and/or, the van just came up too quickly. Fortunately for all, I saw the van in time to swing back into the lane, so itâ€™s hard to know if I saved me from an accident, or a function of the RAV’s technology saved me. Perhaps, like most things in life, the system isnâ€™t full-proof. I am also getting accustomed to the touch screen to operate the sound system. It can be annoying at times, as it often prompts me to save a station when Iâ€™m simply trying to change the station. One must make sure to press the exact area required, otherwise, youâ€™ll end up somewhere you donâ€™t want to be. This writer longs, at times, for the simple buttons and knobs of cars past. Improved technology doesnâ€™t necessarily equate to easier use. But then, I didnâ€™t grow up with much of modern technology. The Toyota RAV4 hasnâ€™t always been the most exciting compact crossover, but it has been very popular, particularly with women drivers. 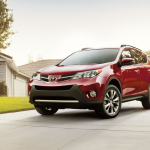 For 2016, the RAV gets a few changes: A new trim package, for one. With seating for five, the, 5-door compact crossover is now available in 4 trimsâ€”the base LX, the up-featured XLE, the sporty and new-for-2016 SE, and the Limited. Both front-wheel-drive (FWD), and all-wheel-drive (AWD) are available; the later an option. We especially like the new black-painted accent wheels, much like those on the last few Toyota products we’ve tested. Sharp look. Toyota RAV4 will also be available in a hybrid version in 2016. The engine in the RAV4 is a four-cylinder, as it has been; 2.5-liter. A six-speed automatic transmission is standard fare, and our SE AWD test vehicle is equipped with paddle shifters, as well. The RAV4 sports standard 17-inch tires and steel or alloy wheels. Opting for the XLE and Limited trims will get you the 18-inch tires and wheels. The power sunroof is standard on the new SE and XLE, Ltd versions. Side mirrors are not only adjustable but also heated. Suspension on the SE version is sport-tuned, but with a ride that isnâ€™t harsh. New for 2016 is the 4.2 inch information display/gauge cluster. Standard Bluetooth, CD-player (slowly becoming obsolete), upgraded Entune infotainment, satellite radio and HD radio are also a part of the package. The RAV4 now has a 7-inch screen-and as we noted-â€œtouchâ€ screen. Even when opting for the entry-level LE trim version, consumers can expect the basic Entune, with â€˜budge-pricedâ€™ voice-activated nav. Cloth and leatherette interior are standard on the RAV4, as are power-adjustable driverâ€™s seat, heated front seats and reclining rear seating. A power liftgate is included on some higher versions. Paddle shifters are standard on the new SE version, as well as different sport-style gauges. Our test RAV4 SE ute came equipped with the Advanced Technology Package which includes Birdâ€™s Eye View Camera with Perimeter Scan, front and rear parking sonar, Entune, Premium JBL audio with integrated nav and App suite and Toyota Safety Sense, Pre-collision system with pedestrian detection, steering assist, auto high beams and Dynamic Radar Cruise Control ($3,030). We couldnâ€™t get used to the automatic high bean feature and found it counter-productive. Having it demonstrated might have left a better taste, but we elected not to use it. When it was needed (by this driver), it didnâ€™t come on. In all fairness, I might have missed the learning curve. As expected in all Toyota vehicles, the standard safety equipment for the 2016 RAV4 is plentiful, and includes 4-wheel antilock brakes (ABS), traction and stability control, front side-mounted airbags, front and rear head airbags, and the driverâ€™s-side knee airbag that adorns the current versions, with the already-noted LED daytime running lights now added. Higher trims will also boast such added standard safety features as turn-signal-integrated mirrors, blind-spot monitoring, and front fog/driving lights. The RAV4 has held well over time and owners most often report excellent reliability, good fuel economy and all-around driver comfort. Appearing in showrooms just recently, the improved 2016 RAV4 will again compete with the Honda CR-V, Mazda CX-5, Ford Escape, and Jeep Terrain.